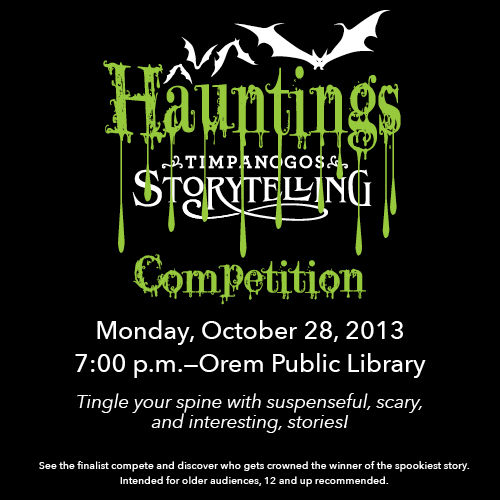 I tried to warn them, but they came anyway, all 24 contestants came and told their scary stories during the preliminary round. All seemed to be going well; no sign of danger anywhere. The stories were creative and fantastic. The judges and I agreed that time was flying by and we were entertained as was the audience. 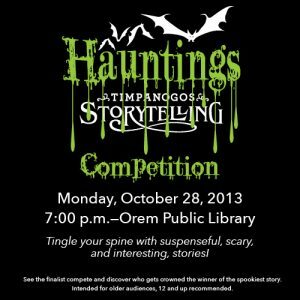 Then we heard a rushing sound coming from the north side of the room as the giant mass of red goo swept through the Storytelling Wing of the Orem Public Library like a flash flood. What was I supposed to do? I had no weapons? It’s not like I had time to call a chemist or biology teacher to find out what I could use to dissolve a giant gelatinous amoeba. It took them, it took them all. It took all of the contestants and then smashed out the south door. I just watched helplessly as they disappeared. I should have done my homework to protect them; but now it was too late. Wait! It didn’t take them all! I could see nine contestants still standing. They were marked with red stains across their faces that said, “Scary”. That’s it! Their stories were scary enough to scare the monster away! All of these were spooky enough to ward off the ooze. I’d better follow the slime trail and see if I can tell the others the secret of how to save themselves.